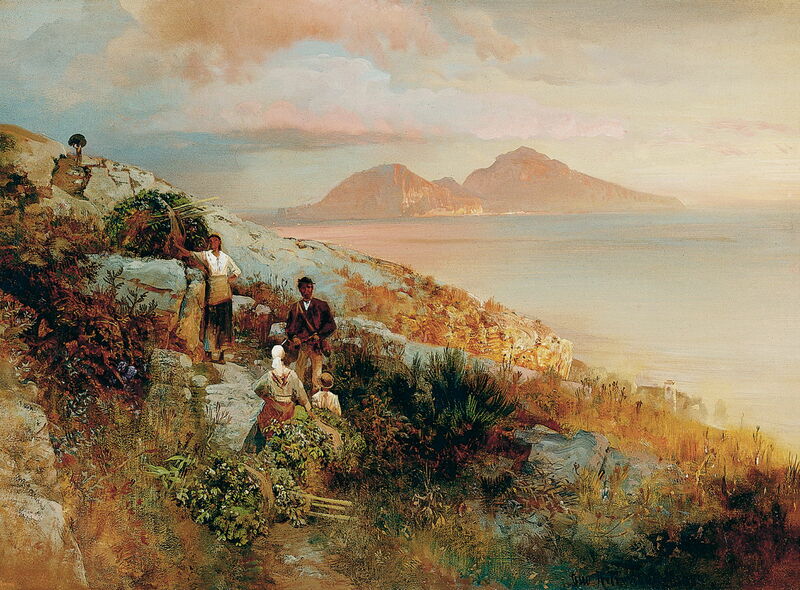 During the early and mid nineteenth century, a succession of artists had visited Capri and painted its coastline. These included several who had trained in Düsseldorf, Germany, and their works became most popular in both Germany and in the USA. Oswald Achenbach (1827–1905), View of Capri (1884), oil on canvas, 44 × 60.5 cm, Von-der-Heydt-Museum, Wuppertal, Germany. Wikimedia Commons. Oswald Achenbach’s View of Capri (1884) is strikingly similar to Alessandro la Volpe’s view in the previous article, showing the island of Capri from a vantage point in the hills above Sorrento. Achenbach was another member of the Düsseldorf School who visited Italy on several occasions during his career. His last extended visit started in 1882, and took him to Sorrento, but he had visited Capri a decade earlier, in 1871. Hercules Brabazon Brabazon (1821-1906), Capri (date not known), gouache on paper, 6.9 x 10.1 cm, Phillips Collection, Washington, DC. Wikimedia Commons. 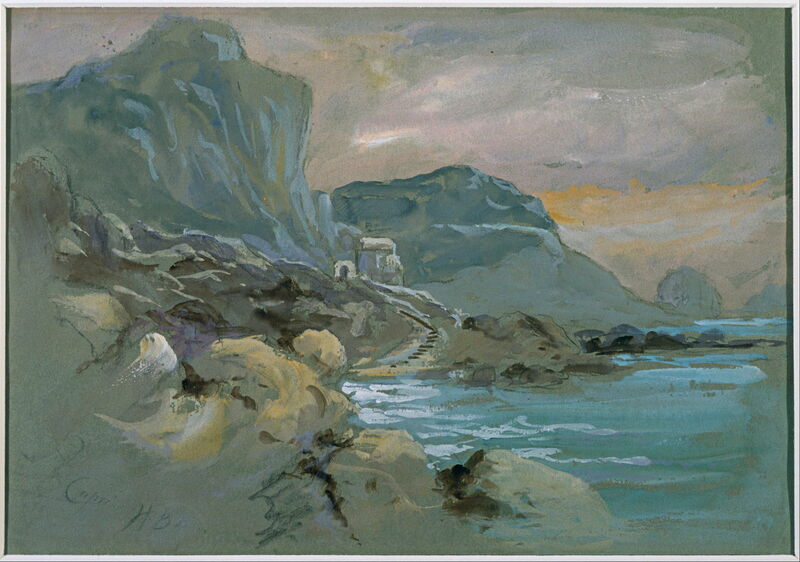 Hercules Brabazon Brabazon’s undated gouache painting of Capri is an unusual nocturne, showing a lonely and rugged section of the coast. An isolated villa stands in the bay, steps curving their way from it down to the tiny beach. This could have been painted at any time from about 1858 to 1904, but was most probably made around 1890. This artist was born Hercules Brabazon Sharpe, which is already quite wonderful, but changed his name in accordance with the requirements of an inheritance in 1847. From 1858 he travelled extensively throughout Europe, painting mainly in watercolour and gouache. As he had substantial private means, he did not exhibit his work or try to sell it until late in his life. He lived instead “for Art and Sunshine”, and was a good friend of John Singer Sargent, who encouraged him to show his paintings. Theodore Robinson was an American Impressionist who trained in New York before heading to Europe in 1876. 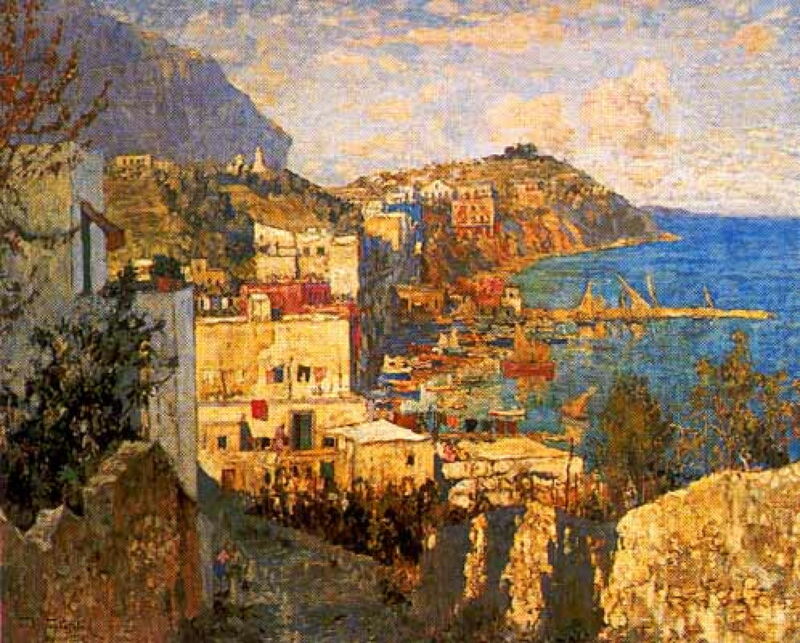 He must have painted this view of Capri (1890) when visiting the island in 1890. 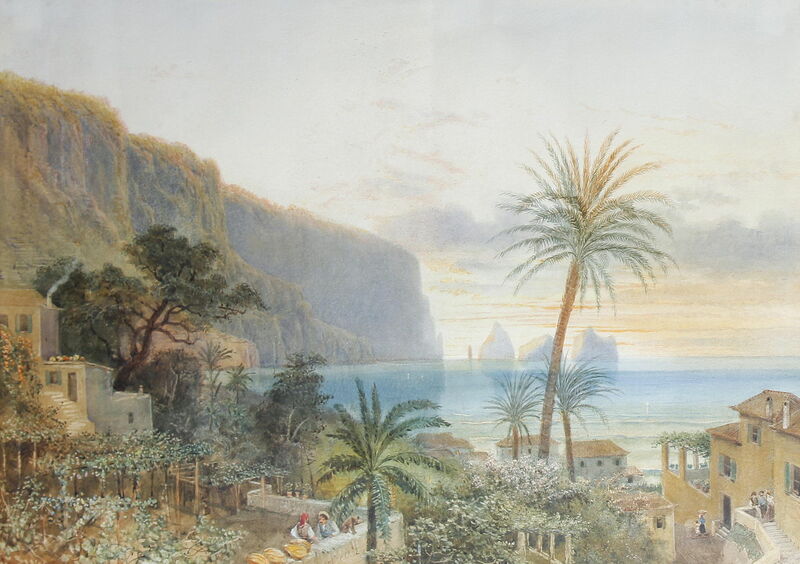 It appears to show Monte Tiberio in the far north-east, from the west, in a slightly closer view than Blechen’s Tiberius Rocks, Capri from 1828-9 (in the previous article). Robinson is most famous for his Impressionist landscapes from Giverny, mostly painted after he had moved into the property next door to Claude Monet. Although Monet doesn’t appear to have visited Capri, Robinson here adapted Monet’s style from his views of the cliffs at Étretat and other rugged coasts. Robinson tragically died of an asthma attack in 1896 when he was only 43. Nicholas Chevalier (1828-1902), View of the Faraglioni, Capri (1892), watercolour, 50 x 73.7 cm, location not known. Wikimedia Commons. 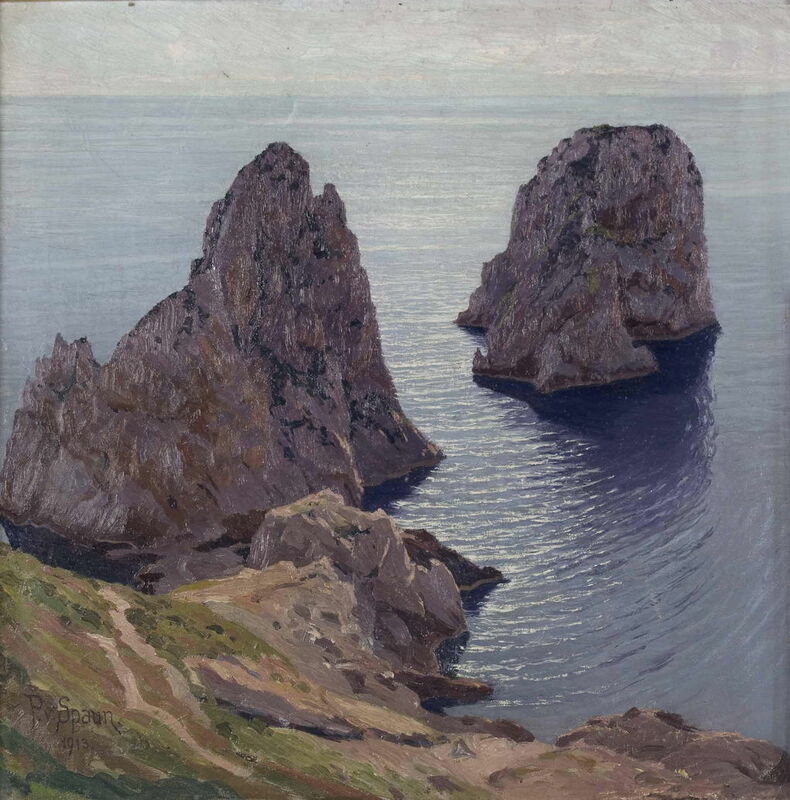 Nicholas Chevalier’s View of the Faraglioni, Capri (1892) is a highly detailed watercolour view painted from the Marina Piccola on the south coast, looking to the south-east to the rock stacks of the Faraglione in the distance. He trained in Munich rather than Düsseldorf, and from 1851 painted in Britain, then in Australia and New Zealand. This work seems to have been made during a visit to the island in his late career, when he was growing old and painting less. Antonino Leto (1844–1913), Capri (date not known), oil on canvas, 21.5 × 30.5 cm, location not known. Wikimedia Commons. Antonino Leto’s undated view of Capri was most probably painted after he had retired to the island in 1882, following his career of painting landscapes and genre views in Impressionist style. I think that this shows the Marina Grande on the north coast, viewed from the east. Leto was originally inspired by the work of Giuseppe De Nittis, and in 1879 joined him and the group of Italian Impressionists who had gathered in Paris. By the start of the twentieth century, painting in Capri was changing again. After his naturist painters’ commune and colony near Vienna went bankrupt after 1899, Karl Wilhelm Diefenbach moved to the island, where others joined him in another commune, perhaps in a more conducive climate. 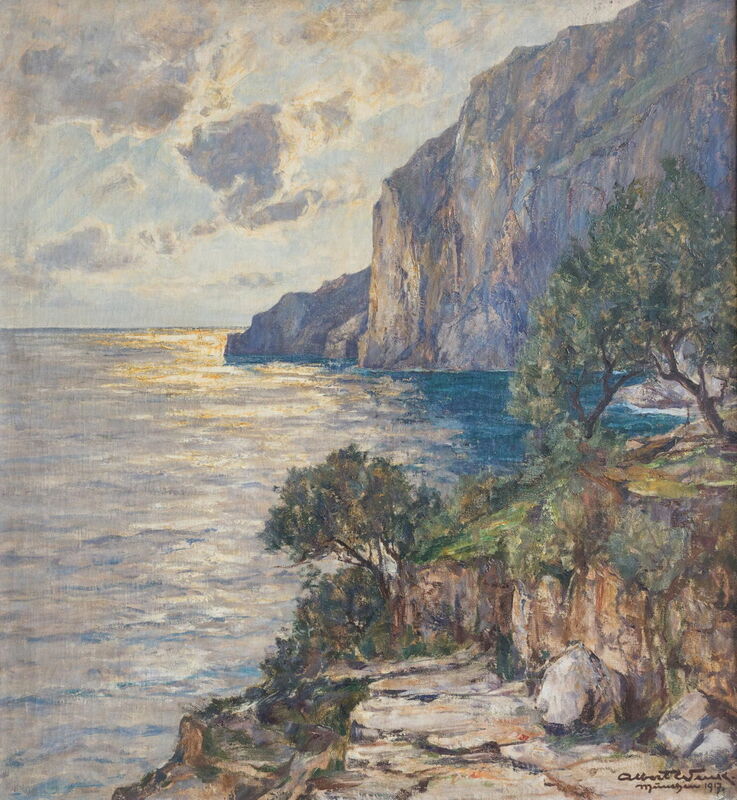 Paul von Spaun (1876–1932), The Faraglioni Cliffs on Capri (1913), oil on canvas, 60 x 60 cm, location not known. Wikimedia Commons. 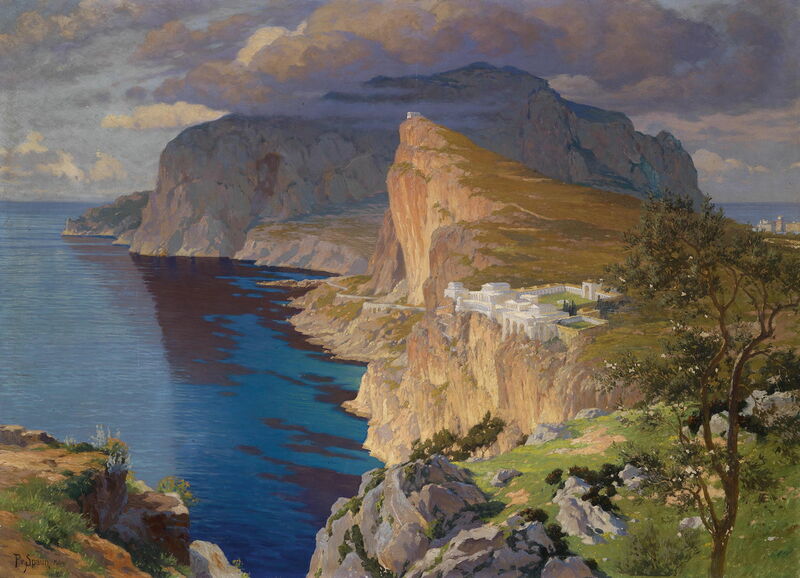 Among them was Paul von Spaun, who painted this striking view of The Faraglioni Cliffs on Capri (1913) from above. As far as I can gather, Paul von Spaun was Diefenbach’s son in law, an Austrian painter who lived in the commune and fathered Fridolin von Spaun, who went on to research Diefenbach’s life and works, and collected his paintings in a museum on the island, in the Carthusian monastery at Certosa di San Giacomo (which was painted by Marie-Caroline de Bourbon, as shown in the previous article). Paul von Spaun’s undated Idealised View of Villa Jovis on the Island of Capri is, I think, one of the most outstanding paintings of the island. But it is not a ‘real’ view, as far as I can tell, rather a composite cleverly built from several different features, much in the way that landscape Masters like Nicolas Poussin assembled their idealised landscapes. Albert Wenk (1863-1934), Capri (1917), oil on canvas, dimensions and location not known. Image by JTSH26, via Wikimedia Commons. 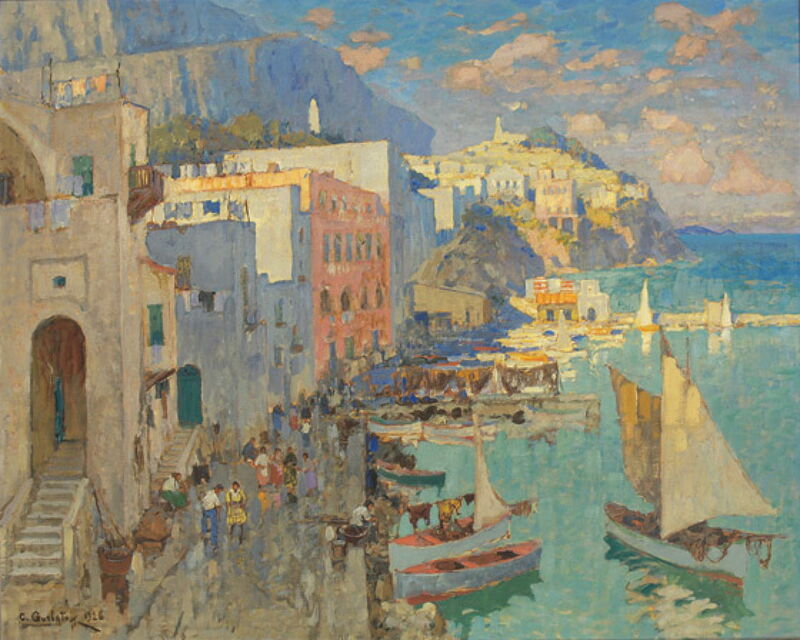 Albert Wenk’s view of Capri, painted in 1917, may look as if it was painted en plein air, but was probably made (or at least completed) in his Munich studio. I believe that it shows the vertiginous steps of the Via Krupp tumbling down the cliff on the south coast to the Marina Piccola, looking to the west in the late afternoon. Wenk had also trained in Düsseldorf. My final three paintings are by the Russian Post-Impressionist Konstantin Ivanovich Gorbatov. He initially studied civil engineering, but in 1904 started to train as an artist. He won a travelling scholarship which took him to Rome, from where he first visited Capri. 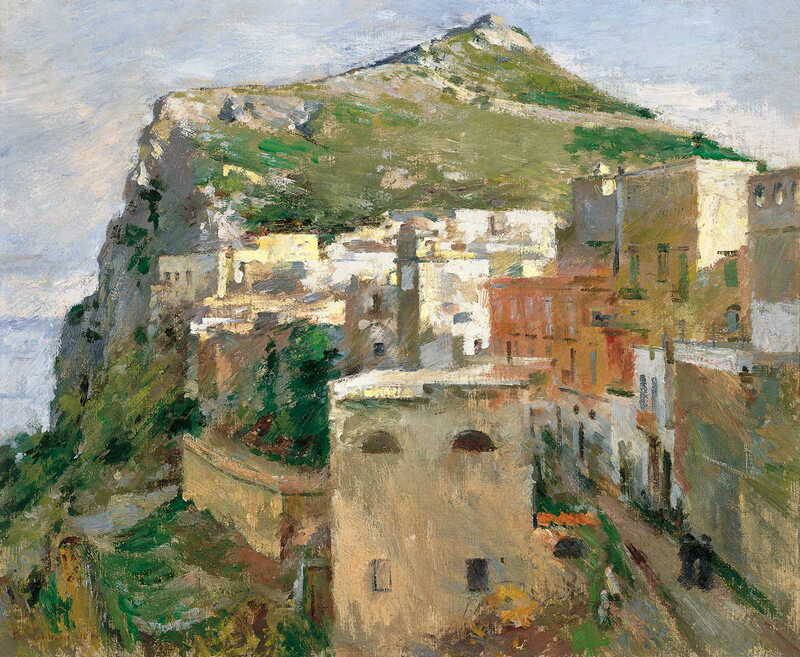 He left Russia in 1922, and from then until 1926 lived and painted on Capri. He next moved to Berlin, where he was an active member of a group of Russian emigré artists, and during the 1930s travelled widely across Europe and the Middle East. His career ended with the outbreak of the Second World War, and he died in Germany just after the Allied victory over Germany. Konstantin Gorbatov (1876-1945), The Port of Capri (1926), oil on canvas, dimensions not known, location not known. Wikimedia Commons. 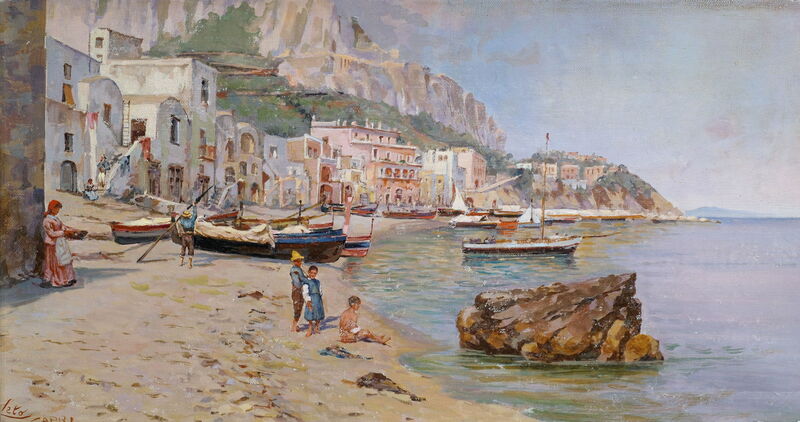 Gorbatov’s view of The Port of Capri (1926) shows the Marina Grande with the first of its jetties which now provide a more sheltered harbour. This looks west over the harbour on the north coast. Konstantin Gorbatov (1876-1945), Capri (1928), oil, dimensions not known, Private collection. Wikimedia Commons. 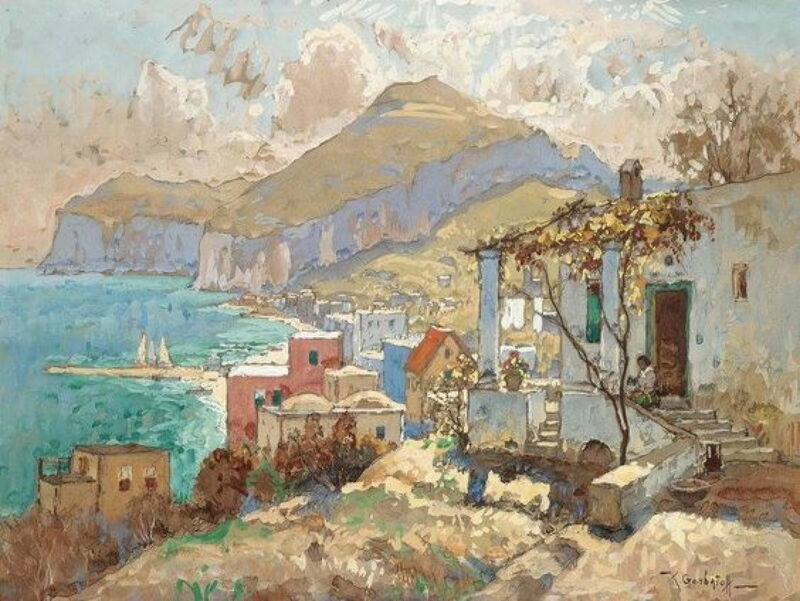 His slightly more distant view in Capri, painted in 1928, shows the high chroma style which he appears to have adopted when he had moved to Berlin. Konstantin Gorbatov (1876-1945), Capri (date not known), watercolour, dimensions not known, Private collection. Wikimedia Commons. This undated watercolour reverses those previous views, and looks east along the north coast, towards Monte San Michele and the more distant Monte Tiberio, at the far north-eastern tip of the island. Posted in General, Life, Painting and tagged Achenbach, Brabazon, Chevalier, coast, Gorbatov, landscape, Leto, painting, Robinson, von Spaun, Wenk. Bookmark the permalink.